swiss-beer-abo makes it possible to explore the Swiss Craft beer. 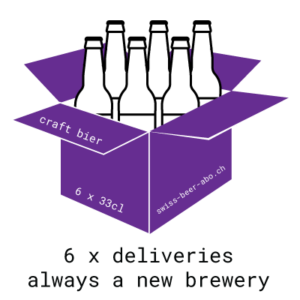 We send two liters of beer with each shipment from one of over 900 Swiss Breweries. The featured brewery changes with each package. 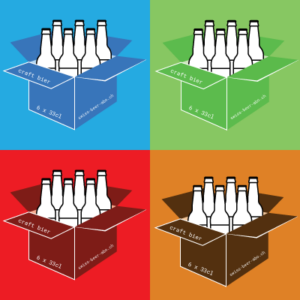 At least three different styles of beer in each shipment. Finding just the right gift for friends, family, or colleagues has never been easier. Find out more about how to send a gift abo to some lucky person. It’s super easy. Cost of delivery (Fr. 10 per delivery) is not included in listed prices and will be added at checkout. Price includes tax. …was launched way back in 2011 by the Bier Factory to help boost exposure for Craft Beer in Switzerland. We understand what it’s like to be a startup Craft Brewery in Switzerland. It’s hard. Because it’s often hard to get a following, sometimes, swiss-beer-abo is a little kick start to get market exposure for a new or smaller brewery. We work closely with the our industry colleagues to ensure that their beer gets out into the market. And we don’t short them their hard-earned cash. We pay a premium for their lovely beers. Which often means we have access to some really unique goods. This also makes swiss-beer-abo the premium beer subscription in the country. We’ve seen lots of positive signals of an improving beer scene here: lots of great festivals, improving selection in retail, and more variety in restaurants. And holy smokes…an explosion of breweries in the past 5 years. How exciting! However, there is more we can do to ensure Craft Beer grows. Our goal is to educate everybody. That education begins with people trying out Craft Beer. This is truly one of our passion projects and is meant to help the whole industry along. We hope you, or the person receiving these craft beer packs, will enjoy them and share the word.